Every once in a while I receive an album that is somewhat tough to review. Tough, because it's likable but just doesn't have that extra something to get me excited yet isn't bad enough to warrant a poor rating. Life Is Too Short To Be Serious, the third self-released album from the Swiss band Arcanum, is one of those troublesome CDs. The band is a pretty straightforward Heavy Metal outfit, though the commanding presence of frontwoman Gabriella Vary adds a noteworthy element. Given their configuration and style, I really expected this album (which from this point forward I will refer to as LITSTBS) to blow me away, or at the very least to make a marked impression. While it's obvious that LITSTBS didn't dazzle me with brilliance, the album does in fact contain a number of interesting moments that could be expanded upon on future releases to create much more of an impact. 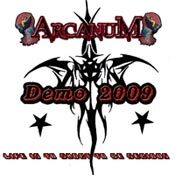 As I said, Arcanum's sound is fairly paint-by-the-numbers Heavy Metal. Their guitar-driven style is openly influenced by the NWOBHM movement, though there are elements of more contemporary European Power Metal scattered throughout the album. Axeman Sile proves that he knows his way around his instrument, whether by spawning some very nice melodic riffs on "Not The One" or laying down some serious crunch on "The Reaper". As solid as he is with the groove and rhythm, solos and unfettered leads are distinctly absent from nearly all of the songs. The exceptions are "Deep Shadows", "Dark Moor", and "Gimme Love" where guest guitarist Andy Dormann (Charing Cross) takes over the lead role and adds a bit of fire to the tracks with some admirable solos and an increased use of atmospheric moments. LITSTBS would have been a much stronger album had the lead guitar role been more defined throughout, but having Dormann guest indicates to me that Arcanum are aware of this and are taking steps to enhance their six-string impact. An aspect of Arcanum's sound that needs little improvement is the rhythm battery of Hägar on drums and Mato on the bass. Most likely due to production woes, Mato's contributions on the four-string are rarely evident. The atmospheric beginning of "Deep Shadows" is one of the few instances where the bass is quite audible, though, giving Mato a brief turn in the spotlight. Hägar's work, on the other hand, is the cornerstone of Arcanum's sound. He's not flashy like Mike Portnoy (Dream Theater), nor is he inhumanly aggressive like Dave Lombardo (Slayer), but he's rock solid behind the kit with pummeling double-kick and a copious use of crash. I've held off discussing Gabi's vocals till last because, in all honesty, this is where Arcanum struggles most. She possesses a powerful voice, to be sure, but on LITSTBS she doesn't display as much control as has come to be expected from Heavy Metal singers. At times Gabi comes off as being somewhat pensive, her voice becoming a bit thin, while at others (the power ballad "Deep Shadows", in particular) her delivery is much more confident and even has a slight bit of a Stevie Nicks shade to it. The leadoff track, "Together Alone", features some very aggressive vocals that, though powerful and lyrically appropriate, don't fit the band's overall sound particularly well. Ultimately, should Gabi shore up her vocals a bit I am confident that Arcanum will experience a sharp increase in attention. Is this review a long, drawn out way of declaring Life Is Too Short To Be Serious to be a so-so album? Yes, I suppose it is. Arcanum writes some good music, and executes it well much of the time, but they lack punch where they need it most - lead guitar and vocals. They do have talent at these positions, but it remains raw, tentative, and unperfected. Improve these two areas and the band as a whole improves tenfold. As for their latest album, I recommend that fans of traditional Heavy Metal keep an eye on Arcanum to see how they progress. I'm sure their best is yet to come.